Strength of materials – a branch of mechanics, discipline, which is studied in schools with a technical orientation. 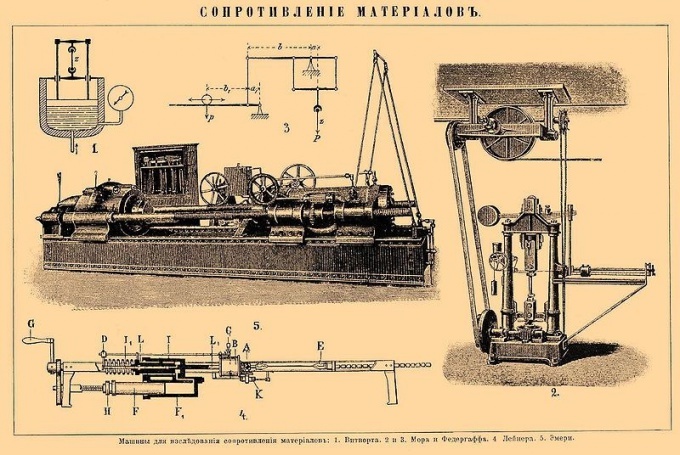 Strength of materials has a specific technique of calculations that require analytical thinking and spatial imagination, so it is possible to solve tasks, which cannot cope with theoretical mechanics. Science strength of materials considers the methods of calculation of materials, products and structures such characteristic qualities as strength, rigidity and stability, while meeting the reliability, durability and cost effectiveness. To simplify pronunciation, called science – strength of materials. Strength of materials is based on such concepts as strength, stiffness and stability stresses, strains, complex resistance and inner stress. Call strength, the ability of a material to resist applied loads without failing. Stiffness – the ability of a material under external influence, to preserve the geometric dimensions within acceptable limits. Sustainability is the ability to maintain a stable shape and placement of external influences. A body is subjected to a force, then in the body there are internal efforts that counteract this force. If the external force dominates, the deformation of the body. Distinguish between the deformation angle (rotating sections), and linear (lengthening, shortening, shift). For measurement of deformations in laboratory conditions, serve a variety of devices: mechanical, optical-mechanical, electrical and pneumatic strain gauges. The basis of the strength of materials based on the following Sciences: mathematics, physics, materials science, theoretical mechanics. Applied strength of materials in the design construction and engineering of structures, mechanisms and products. The structural strength, the design is obtained by applying failure theories – science, which examines the conditions under which materials fail under the action of external loads. Depending on conditions and load types most materials can be classified as brittle, ductile or both types simultaneously. In practical situations, the materials clearly belong to either brittle or ductile. Strength of materials is not an exact science because formulae are derived based on assumptions, how can behave a particular material. In the design of buildings and structures, all the strength characteristics of the material are determined with a certain margin, because the results obtained through the discipline of strength of materials are estimated. Mechanics of materials is one of the most difficult Sciences. Its study requires attention.